What Are the Differences Between Backup & DR? Data loss and security breaches are becoming increasingly common events in the modern business world. All of a company’s information must be protected and readily available at all times in order for a business to survive. Considering this fact, the importance of backups cannot be overestimated. However, while backing up crucial data is an integral part of any business’s IT strategy, having backups is not the same as having a disaster recovery plan. This brings us to the question of what the difference is between backup and disaster recovery. These concepts are commonly and mistakenly used interchangeably – in order to explain the differences, let’s take a look at each concept separately first. In simple words, backup is a copy of your data as well as the process of creating such copies. Backup plan is a planned procedure of backing up your environment, either manually or automatically, according to a schedule. Backups are preferably stored in a separate data center in a remote location, as well as on a different media (such as disk or tape). Such practices stem mostly from the 3-2-1 backup rule, which states that you should have at least 3 copies of your data, 2 of which should be kept on different media, and 1 copy should be stored offsite. Many modern businesses choose to virtualize their environments and, thus, virtual machines are backed up as commonly as physical ones. Backups can be deduplicated and compressed to consume less storage space. However, performing simple backups is not enough for a modern company; maintaining business continuity in the face of any disaster or unforeseen event is a must for any company that does not wish to lag behind. This is where disaster recovery comes in. Disaster recovery is a set of measures aimed at restoring the business processes of a company in case of disaster, avoiding significant data loss. Disaster recovery plan is a documented procedure for setting the DR measures in motion with respective priorities and responsible persons. Disaster recovery is an integral part of business continuity, which is a wider concept that includes measures designed to continue business operations as usual when disaster strikes. Generally speaking, while business continuity involves proactive measures to keep the business running under any circumstances, disaster recovery is more reactive and involves specific steps a company should take to resume business operations in the event of a disaster. Disaster recovery normally includes a relevant DR solution, which is usually software that can transfer workloads of your IT infrastructure to a separate DR location. This process is called failover and is an integral part of any comprehensive DR plan. When it comes to virtualized environments, dedicated disaster recovery solutions can be rather varied, with the most common ones allowing you to replicate business-critical virtual machines as well as perform failover to such VM replicas reconfiguring the network settings in the process. This allows VM replicas to start working almost immediately. Different Purposes. Backups work best when you need to gain access to a lost or damaged file or object, such as an e-mail or a PowerPoint presentation. Backups are often used for long-term data archival, or for purposes such as data retention. Basically, if you need to store data or want to have something recovered, whether a single file or an entire VM, simple backups are a helpful option. However, if you want your business to quickly restore its functions after some unforeseen event, you should opt for disaster recovery. With both the DR site and DR solution in place, you can simply perform failover to transfer workloads to the VM replicas at the DR location, and your business can continue to function as normal even if the production site is unavailable. Different RTO and RPO. Setting up Recovery Time Objective (RTO) and Recovery Point Objective (RPO) is crucial for any business. The former is the amount of time in which you need to recover your data after a disaster before any significant damage occurs, while the latter is the maximum amount of data, measured in time, that your company can afford to lose before suffering serious consequences. Determining RTO and RPO is crucial for both backup and disaster recovery planning, however they significantly differ for both of these strategies. Backups have longer RTOs and RPOs and thus are not suitable for business-critical data that you need restored after a disaster ASAP. Disaster recovery, on the other hand, implies replicating your critical VMs with the aim of quickly performing failover if necessary, which means that DR can accommodate much shorter RTOs and RPOs. The need for resources. Backups are usually stored in a compressed state and do not require much attention or storage space. Depending on the media, such as tape, they may require little to no additional costs at all and can be restored even years after the initial backup. Disaster recovery, on the other hand, requires a separate site with fully operational IT infrastructure that should always be ready for possible failover at any time. Comprehensive planning process. The backup process is rarely complicated: a company simply needs to establish and stick to their Recovery Point Objectives as well as requirements for data retention. With disaster recovery, things instantly become more complicated. Besides the need for the additional resources mentioned earlier, a company needs to evaluate the importance of business applications and prioritize the recovery order of the VMs running such applications. For instance, the VM housing your CRM data is most likely more important than the one which has HR data on it. Furthermore, every comprehensive DR plan requires extensive testing, as failure to execute the plan during actual disaster can have dire repercussions. What should you choose for your business? A short answer is that you should integrate both backup and disaster recover planning into your data protection strategy. Modern business landscape values the “always-on” principle, which means that a company should be ready to deliver services or goods to the customer at any time, despite the circumstances. Backups should mostly be used for long-term archival purposes as well as to have access to the VMs that are housing important information that you may need to recover. However, when it comes to VMs with business-critical systems and apps, they should be a part of your disaster recovery planning. This does not only ensure business continuity but can also help you protect your company’s critical data in case of disaster. If you have chosen to invest in DR planning for your company, you may want to consider choosing the appropriate solution first. Such solution should be not only reliable, but also flexible in order to allow for multiple testing options as well as accommodating virtualized infrastructure of any size. 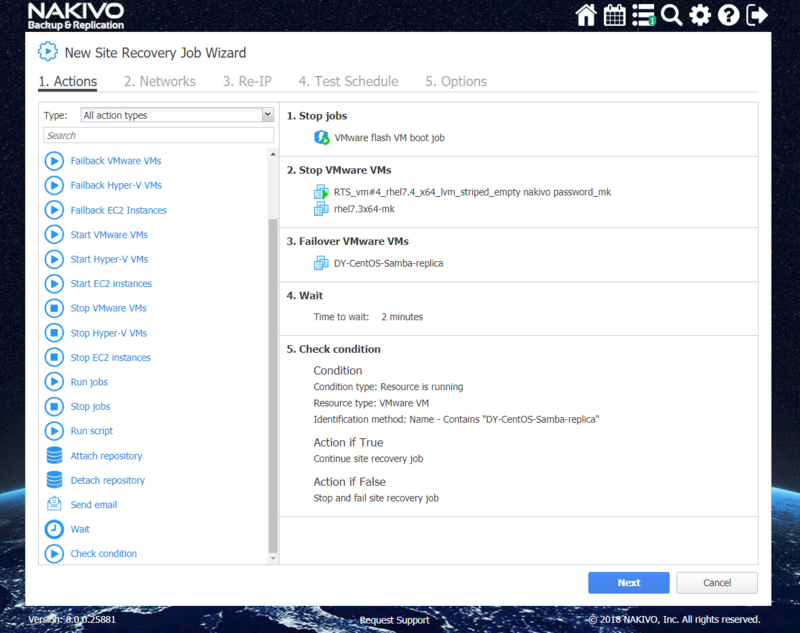 NAKIVO Backup & Replication has the in-built Site Recovery functionality that allows you to create recovery workflows of any complexity, and has a flexible test scheduling system to make sure that your environment is always ready in the event of disaster. Site Recovery enables you to construct workflows by combining specific actions, such as stopping or starting specific VMs, performing failover, running a script, etc. By using these actions, you can create either a simple workflow that performs a failover of your virtual environment, or a multi-layered, complex one that starts specific jobs or uses other Site Recovery workflows in the process. Additionally, Site Recovery is a part of NAKIVO Backup & Replication, which means that you do not have to pay for a separate solution. By purchasing one product, you effectively get the powerful data protection solution and a reliable DR solution, in a single pane of glass. Performing regular backup is not the same as having a disaster recovery plan in place. Backing up your VMs effectively means copying your data with the aim of either data retention or long-term archival. Having a disaster recovery plan is a part of a business continuity strategy, which makes sure that your business-critical systems continue to operate after or even during a disaster or other unforeseen circumstances. Although having a disaster recovery plan is usually preferred to simple backups, the decision may ultimately depend on whether your business truly needs it, and if you have the resources to be ready to invest in its creation. NAKIVO Backup & Replication offers full package of backup and disaster recovery solutions in a single piece of software. Download our full-featured free trial to test out the solution in your own environment!